Excelente localização no centro da cidade de Bar Harbor em Mount Desert 4 St. Minutos para todas as atividades dentro da cidade e do outro lado da rua do sistema de ônibus Island Explorer, que oferece transporte gratuito para Acadia National Park e da ilha - eles ainda têm um bicicletário. O apartamento está dentro do Corredor histórico e perto de lojas, restaurantes e teatros. Relaxe no deck superior com vista para o verde da vila e aproveitar o talento local às segundas e quintas-feiras com a banda comunidade. Caminhada fácil para qualquer uma das frente de água e lojas de Bar Harbor. Julho Até meados de agosto, shows da banda local em Mon. e Thur. Great Location! Right in the heart of Bar Harbor! This was a fantastic location that is just across the street from the Village Green Park! Just walking minutes to great restaurants and shops up and down Main Street! Mo and Scott were very accommodating hosts and we would rent from them again. Thanks Scott and Mo! Ideal location. Plenty of room for all four of us. Fun to be right on the green but amazingly quiet inside! This was our second stay and we hope to be back again. Spacious and great location. Interior is a little tired, someone reminiscent of student housing. My review is similar to many others so hopefully folks considering this property get a sense that the location and spaciousness of the apartment can't be beat and While the amenities/furniture are dated they were all in working order. location was awesome. You're in the middle of the downtown village area and it's great to walk to restaurants and shops. Also we were a little worried about the 2 hour parking limit and we didn't have any problems. We were usually out and about and got back late enough that the time limit didn't matter. I wouldn't let this dissuade you. The apartment had plenty of room for the 3 of us (myself, husband, 19 mo old) -- our daughter loved looking out the big window at the busses and dogs going by. We also didn't have a problem with any noise from neighboring restaurants/pubs so that too shouldn't be of concern. Other pluses: window AC units that worked well, wi-fi, hot showers!! I would book the apartment again! Perfect location and hosts that make it easy! 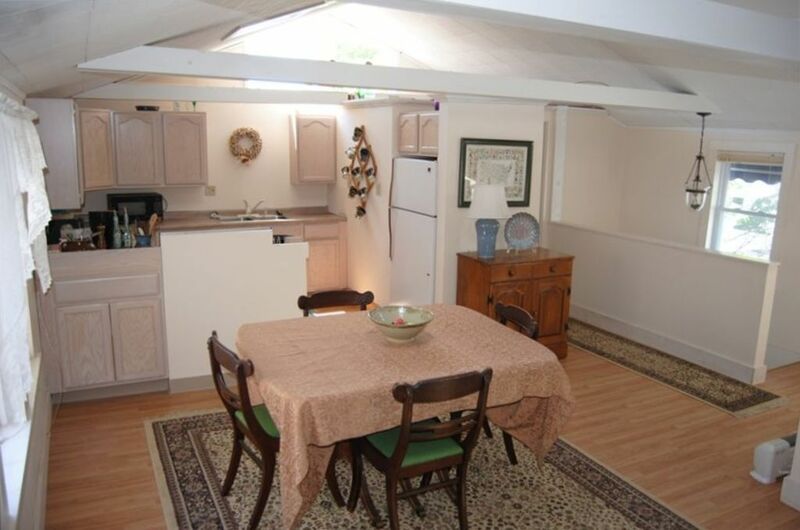 We loved our time in beautiful Bar Harbor and this spacious apartment is right in the middle of it all. We loved having a little balcony area to enjoy the summer nights while our little boy slept peacefully inside. Parking is a bit of a challenge, but you can work around it with a little effort. The hosts provided everything we needed and we're great with communications. Overall would definitely recommend staying here!